Published by L&L Pardey Books, Arcata, CA and Kawau Island, NZ. 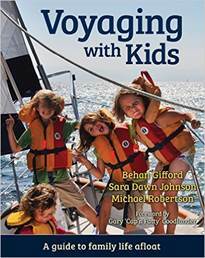 Voyaging with Kids is a beautifully designed and very comprehensive reference on cruising with kids. It covers everything from picking your boat to what to bring along, how to stay safe and healthy, provisioning in far away places, and activities to pass the time or expose the kids to new experiences. There is a full chapter on boat schooling which has some very interesting suggestions, like attending local schools while voyaging and dealing with rules and regulations of the home country. The book also covers the transiting nature of voyaging by boat and how it influences relationships both aboard and on shore. It provides detailed advice on passagemaking. 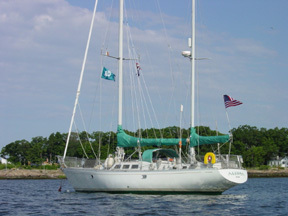 It even covers how to deal with the challenges unique to babies and teenagers aboard. Finally, it deals with the challenges faced when ending the voyage and transitioning back to a life ashore and all the things that will stay with them forever and keep them grounded on the land. Voyaging with Kids ends with interviews with and letters from former cruising kids. They talk about their life aboard and ashore, what they learned from both, and how they dealt with the transitions. It’s really inspiring to read about the great takeaways these former kids remember and how those learnings shaped their future lives. Bottom line, you get the sense that they became better human beings for the experience. The book is rich with photographs of kids doing interesting things in exotic places. It also focuses attention on the ability of children aboard to take responsibility and contribute to the tasks at hand. They learn independence and self-reliance from an early age, very valuable traits in this passive world. They also learn what’s important in life in general and what’s important to them specifically, not like the kids in routine lives ashore who just follow along with what everyone else is doing. The Index is very handy for looking up specific topics. There are six pages of contributors listed, three pages of bibliography, and thirteen pages of additional resources and references used in researching material. Voyaging with Kids is a really important addition to the cruising armamentarium for anyone contemplating life afloat. What these authors have done is extraordinarily valuable. They’ve done enormous research to provide access to the kind of information every parent needs before taking off, and they share real life assessment of how everything actually translates into practice. This is destined to be a bestseller in the sailing books category…the parenting bible for the cruising family. I believe it’s the first book of its kind, and that is an accomplishment in itself. Although the book is not being formally launched until October 1st 2015 when the interactive eBook will go live, the printer put Voyaging with Kids at the head of his line-up. Books will actually reach the distributor’s warehouse (Paradise Cay publications) by the end of August. Because of this the authors are celebrating by offering a 30% discount to anyone who orders directly through the publisher’s website www.landlpardey.com (run by Paradise Cay) for any books ordered by September 15th. Books will ship as soon as they arrive at his facility. To be fair to all retail outlets, Amazon will not have books until October 1st.